The shamanic paradigm in our culture area is, in its basic concepts, shaped individualistically. There is a set of techniques, which however in their details are carried out differently by each practicioner. The various cultures focus on those techniques which in the respective contexts are the most adequate ones to guarantee survival. 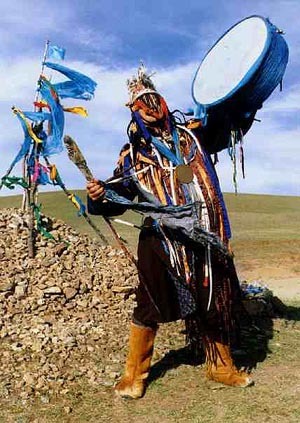 This can very well be observed in tuvinean shamanism: the individual shamans have certain cultural elements of their shamanic practice in common, but the respective manner of implementation is highly individualistic. The drum is often used as a trance-inducing instrument. Especially neo-shamanic circles frequently are literally possessed by drumming. Other instruments, like didgeridoos, rattles, rain makers, singing bowls and so on are used as well. The whole purpose of these instrument is to achieve the so-called "sensory deprivation", which facilitates the trance-journey in its proper sense. The choice of instruments also determines the basic frame of the journey and the way how the journey is experienced. The person who plays the instrument should at least know that the instrumentalist's intention is at least as important as the instrument itself. The intention affects the way the instrument is played, and through the music it is transferred to the shamanist journeying. Additionally, the instrument's role as the journey's delineation is important: no music - no (more) journey. In practice, it has proved to be worthwhile to agree upon a return signal, which is played after a predefined time span, and which tells the shamanists on their journey to return from sauntering in the twilight. In the traditional context, the drum as well as the costume have, apart from several other shamanic meanings, a protective role and trance-supporting functions. Fringes in front of the eyes irritate and block the view of the normal reality. Even putting on the costume induces the trance, because the shaman's costume itself is equipped with items in the twilight. That way, however, shamans could be easily identified in the former Soviet Union. During the communist era, shamans were prosecuted mercilessly. Just possessing a drum or a shaman's mirror could mean the owner's death. That way, the shamanic tradition was almost eradicated. Shamans were thrown out of airplanes; cynically, one wanted them to demonstrate their soul's flight. The shamans had a strong influence on the population and therefore inhibited the socialist machinery of power. Only few shamans survived this period. Today, the siberian peoples recollect and revive the old, almost extinct tradition. The drum's rhythm and the shamanic chant sound undisturbed again and form a bridge between reality and otherworld. Personally, I use the drum as an instrument that induces trance with the client, and as a "mount" for myself, as I can achieve the induction of trance and the trance itself without a drum. Within a shamanic session, I like to use the drum to enable the client to fall into trance. Because it often might cause trouble to use a drum in the modern environment, the idea of "canned drumming" established itself quite soon. You may download my own "drum cans", free of charge, of course, and save them on your MP3 player or on CD. There are two of them. The first one lasts five minutes, the second one lasts about 25 minutes. A return signal is included in both drumming tracks. Today, the term shamanic journey is understood in different ways by the various practicioners, because there is no really precise definition of the state of consciousness in which the journey is made. This vagueness is caused by the fact that the leaders of workshops only rarely know about the different states of trance. For that reason, I need to establish a more precise definition. The shamanic journey is a kind of mental or astral journey. If mastered, the experience is partially comparable with the "out of body experience" (abbreviated usually as OOBE) - experiencing a complete separation of the body of perception. The depth of trance in which the shamanic journey is done is not necessarily important for the result, but it is for how one experiences the journey itself. The deeper the achieved trance is, the more intense the experience will be. Another element of the definition is that the shaman performs the journey consciously and deliberately, because it is of crucial importance for him to do a journey when it is necessary, no matter what time of the day it is or in which state the shaman might be. Sometimes the events don't mind how drunk or how tired a shaman might be. Luckily, this happens very rarely, but it does happen. It is important to have an issue to be worked on during the journey. Especially as a beginner, you should never start a journey without a clearly defined issue. Especially in the early stages you learn a lot about the twilight. Because a shamanic journey shall also cause a result in normal reality, it is important to attend to a specific question or topic during the journey. It is extremely important to define the topic very specifically. Slight inaccuracies in phrasing the topic may well lead to different results. There is a difference whether I phrase: "I want to search for my power animal", or: "I want to find my power animal". Think about it. Language is very precise in its meaning. Choose a place in nature that you like, and memorize it. This place does not necessarily have to exist in reality. Imagine it in your mind and try to perceive it with all your senses. The more intensive the perception is, the more present you are at that place. Now look for a possibility to get upwards or downwards. There are no limitations to your fantasy as to how the path or the medium of transport should look like. The tunnel (or whatever you choose) will end at some point. It might happen that obstacles block the way. Try to detect and bypass them. If it doesn't work at all, simply try to find a new entrance. Often it is necessary to re-learn a certain suitability for daily use in the twilight. I don't know how often it happens to beginners that they are confronted with seemingly insurmountable difficulties. Beginners often tell me that they don't see anything except darkness in the tunnel. Honestly: What would you do if you enter a tunnel of which you know that it doesn't have artificial lighting? Correct! You'd at least take a flashlight with you. Not only that: You'd also switch it on to take a look at the tunnel's walls. Well; in the twilight, even a mature personality, who is firmly grounded, may find himself in the awkward situation not to know what he could to do see something in the dark. The really obstinate ones then say: "Yes, I lit the torch, but I still don't see anything" - that, too, is logical, because there are several reasons why someone might be unable to see. For example the proverbial "plank in front of the head" (in German: "ein Brett vor dem Kopf haben"). In this case, however, the plank is to be understood literally and not in the sense of being a blockhead. If your view is blocked, you cannot see anything. The beginner even has the solution for the problem at his hands: the blinds. He simply has to take off the blinds in the twilight. Another problem typical for beginners is that people report they couldn't move. In daily life, the first impulse would be to look down, to find the reason why one doesn't get one's feet moved. In the twilight, this is an idea you first of all have to think of. The exit of the way you've chosen is located either in the shamanic upper or lower world, or simply in the otherworld. When you return from your journey, you simply turn around, go back the way you had come, and get out at your place of power. You should always return that way, and don't rush it. It is a part of your soul that is journeying, and it is definitely better to return whole from a journey. The shamanic journey is closely related to lucid dreaming and dreams in general. In this context, one observation is remarkable: the more one practices the shamanic journey, the less there will be non-lucid dream sequences at night. I experience this connection very clearly. During an inactive period, when I do shamanic journeys only maybe once a month, the intensity of my dreams increase considerably, with the dreams being pre-lucid or lucid. In periods of intense shamanic activity the pre-lucid dreams decrease in frequency, whereas the lucid dreams maintain their frequencies. Generally, the number of lucid dreams increases, the longer and the more intensive someone works shamanically. This observation allows to conclude that the dream-body and shamanic body-of-journeying are identical or at least very similar to each other. The ladder is one of the traditional ways upwards. People like to use ladders to ascend to the Upper World, the heaven. Of course no real ladders, but heavenly ladders. Ladders as shamanic routes are known to the Mangar tribe in Nepal, the Malay tribes of the Southern Philippines, to the Dudun on Borneo, and the russian Voronezh. The biblical version is Jacob's Ladder, which Jacob dreams about and sees how angels ascend and descend on this ladder. As an "axis mundi", this heavenly ladder also connects earth and heaven. As a connection between earth and heaven, the ladder was called Seth's ladder in Egypt - and once also as Horus's ladder, which however does not refer to the usual Horus here, but Dwn-'nwy (Middle Egyptian: "Who Spreads Out Two Wings"). Lucid dreams are dreams in which the dream world is extremely real and in which you are able to consciously control your actions. They can be induced very easily if you follow two rules when going to bed: you go to sleep with the intention to awake in the dream. It is also often recommended to look at one's own hands in the dream. Second, you set your alarm clock to about two thirds of the usual duration of your sleep. When the alarm clock rings, you busy yourself with something entirely different for about an hour, and then lie down to continue the sleep. In this second phase of sleep, the chance to get lucid is very high, and you will reach lucidness very fast. Before you go to bed, you may also wash and massage your feet to induce lucid dreams. The following version of the shamanic journey has been derived from celtic traditions: You watch yourself standing in the room in which you begin the journey and in which you are staying. Then you let mist rise until it completely fills your field of vision. A little bit later, the mist disperses and you are "on the other side", in the twilight. At the end of your journey, you simply let the mist rise again in the twilight, and that way return to the room where you had started your journey. This method is easier and often faster to do than the usual method with the tunnel. The distinction between upper and lower world, however, does not exist in that case. The first meaningful subject, that should be handled in our first shamanic journey, is the power animal. In the various shamanic cultures, the importance of the power animal varies quite a bit. Every human has one or several power animals. The power animal is sort of an ally, is your guide in the twilight. There are many ways to find or meet one's own power animal; one of them is the shamanic journey. Consequently, the subject for the first shamanic journey would be: "I want to find my power animal." — As pointed out earlier, a beginner should always define a subject for his shamanic journey! The spirits appear more easily when there is a precise intention connected with the journey. Later, when you've practiced more, "free style" journeys might be interesting as well. I do both myself, even though I still tend to work with certain subjects. The power animal usually is very interested in establishing contact with you. If it is not present, call or search it. Power animals are easily discernible as such. They behave very different from the usual reactions of wild animals toward us humans. Often these animals even talk, but they tend more to communicate via actions or facial expressions. In the first journey, you become acquainted with your power animal and play with it for a while. Later on, your power animal can lead you to places in the twilight or to other spirits that want to help you with specific questions. You may have more than one power animal at once. In this context, it has turned out that in case someone has several power animals, each of them has its own specialty for which it is competent. For strength this might for example be a bear, an eagle for foresight, and for courage a wolf. Mythical creatures aren't very frequent as power animals, but there are some, as well as prehistoric or extinct species. The power animal that you come across first will not necessarily remain your only one. There are many people whose power animals change from time to time. One power animal leaves to make room for a new one. We can only speculate why that might be the case. One possible interpretation is that the respective animal corresponds to the shaman's situation in life. I have my own one now for almost two decades - so there are many possibilities. Every human reacts different to the technique of shamanic journeying. One common result is that someone sees the place of power and the entrance, but the shamanist is unable to move. Apart from the immediate problems mentioned above, the reason for this sometimes has to be searched for in the individual's personality. The expectations or the doubts are so huge that all other movements are inhibited. The shamanist literally stands in his own way. Doubts about the vision's validity or reality are a typical result of western education. The twilight's existence is denied because it is (as yet) imcompatible with the natural sciences. It is a good method to tackle this problem to simply take it for granted during the shamanic activities that it works. The sceptic in us may return after finishing the journey and its subsequent assessment. Sometimes there are persons who don't see anything at all when they close their eyes and try to imagine a place of power. A guided shamanic journey, where the shaman describes the arising pictures, might lead this individual to a vision. But maybe these simply are individuals who predominantly perceive their environment acoustically or sensorically. So don't give up just because you don't see anything in the twilight. During the journey, there often are leaps between scenes. This is common especially in states of light trance, and is completely normal and usually doesn't cause any trouble. When one gains practice in journeying and reaches deeper levels of trance, these leaps get less frequent. In case something pulls you out of the journey and you return to normal reality, don't panic. You will be able to continue at exactly the point you were interrupted. However, if you don't return, there is a certain risk to loose part of your soul. But usually you are accompanied by your ally, and for that reason the danger is very low. In the beginning, the vision often is a little unclear. The first journeys may well feel like they were just imagined, because they are relatively easy to comprehend. That is normal, too. Nobody is born a master. Doing shamanic journeys is like playing a musical instrument, one has to practice to master it. I've seen over and over that beginners complain about the lack of adventure in their journey. It can get quite a bit in one's way if one expects a journey to be an 3D Dolby Surround experience. My own first journey was far from being a model of clarity. I remember even today that I thought: "Great, now I've made myself believe that. An andean condor as power animal. When I tell that to my falconer, he'll laugh at me!" — In the end, it turned out that everything was and is completely different. You may take any items offered to you by the spirits in the twilight, if you know what they are resp. whether you are allowed to take them. Usually, the beginner behaves like a toddler in the twilight. Obvious attitudes like courteousness, friendly distance or normal good manners, like asking when anything is unclear, are disregarded. This leads to misunderstandings in the twilight and may spoil the relationship to one spirit or the other. On the other hand, most spirits are quite well informed about your stage of development and smilingly tolerate such beginner's mistakes. It may happen, however, that they put you through this or that lesson about attentiveness to prevent you making that error again. It is quite a challenge to assess the journey's result as such. It is important to know that you are the only one who is able to interpret your own journey. Helpful hints given by experienced shamanists or shamans are at most suggestions for your own view of the journey. One feature of shamanic work is that answers sometimes are comprehended only very much later. The shamanist simply misunderstands certain circumstances and first needs to mature mentally before being able to understand the answer or the whole journey. This is a process that never ends. Even after years of practice problems like this may arise. Beginners often tend to take the answers absolutely literally or take feelings at face value. The blinders resulting from this block the view to new answers or different perceptions. That can go to such lengths that one is absorbed by a universe that is determined by visions more and more limited. Often this is accompanied by overestimating one's own capabilities or by the phenomenon of the inflationary ego. For that reason it is very good to remain in contact with other shamans to judge one's own vision. Unfortunately, the traditional Western culture is widely missing a controlling mythological element, which would embed the journey into a fixed view of the world as would have been the case in traditional shamanic cultures. However, the old european matrix of twilight slowly begins to gain popularity, even though it is still difficult to come to terms with the Nazi past, who made many elements of this matrix their own, like for example the runes. On the other hand this shortcoming is at the same time a big chance to create our own new myths. After some time you will find that there are certain rules or sort of a geography in the twilight. This geography varies for each of us and offers lots of material for our personal mythology. During their activities shamanic travellers should step by step build up sort of a map which shows the most important locations of the twilight. There is a whole world to be explored in the twilight. For some this may turn out to be very difficult, perhaps because the landscape continually changes, for others it might indeed be possible to draw a map. Locations like the world tree, the entrance to the realm of the dead, the river of time, of fate, of the souls, of life, and their springs, important places where teacher or specialists dwell, landmarks like peculiar mountains, lakes, etc. etc. The twilight is not uninhabited. Often unexpected companions appear in my own journeys: animals of a wide variety and many sorts of spirits. Even cities may be found there. At the entrance of the realm of the dead there might be a place where a guard demands a sacrifice or a fight. The twilight definitely is not a rose-tinted paradise of your dreams, but the origin of many myths. My own shamanic Lower World has a specific orientation of the cardinal points. It is somehow upside down - what would be East in the normal world, is West there. A few years ago, I experienced condor showing me a special place. The interesting point about that place is that it is a flattened mountain top. Around 1998 I read in a book about south american shamanism (Elizabeth B. Jenkins: "Die Rückkehr der Inka", München 1997), a description of exactly that place - with many similarities regarding the spirits present there. On my question my power animal only laughed, asking why I hadn't known that before. Today, after having taken a look at the wider environment, I know that it is located in South America, around 15000 to 20000 years ago. During your shamanic career you will sometimes receive very personal information about yourself, your allies and your clients. It is very important to ascertain how much of that information may be passed on to others at all. Names are a good example. A power animal or ally, who tells you his name, communicated it to you only and to nobody else. If you are looking for information about that name, you should - unless the spirits have told you otherwise - assume that the name is a secret. You can call the spirit with that name very easily and have a direct way of communication. That is, of course, true for all others who know this name. You should deal with your own shamanic name in a similar way. Your instinct can be a sure guide here. In any case you should ask your allies before you disclose your own shamanic name to others; perhaps it is only meant for the spirits to hear. As it may well be quite a problem for the average reader to accept the reality and independent existence of the twilight, I suggest a little exercise which I've done in my drumming group for years, to convince newbies as well as long-time participants: You choose perhaps two dozen or more interesting photos and put them separately into non-transparent envelopes. During a drumming session, you draw one of them and put it, still closed, in the middle of the circle. One might also use a little box containing a significant shamanic item. In both cases, the item or photo is the target of the shamanic journey. You can examine some questions this way: to what extent can the experiences of a shamanic journey be seen literally, and to what extent figuratively? You can check with that method if you want to know if the claims made by one of those rather bigheaded fellows are correct or not. You can have the participants do a shamanic journey to examine hidden capabilities of that item or special details of the location shown by the photo, without preprogramming the journeyers with too much information. I usually take about thirty envelopes with me and let one participant draw one of them, which then is the journey's target. Each time, the task is given as follows: to journey to the place shown by the photo. Additional tasks might be given as follows: to find spiritual or shamanic aspects of that place, to examine the place's energetic peculiarities, to visit the place's spirit.